Phillip J Anderson is Managing Director and founder of Economic Indicator Services (EIS), an economic forecasting service operating out of London and Melbourne. EIS is the world’s foremost authority in the area of business, real estate and commodity cycles. Subscribers to the service are educated to the movements of these cycles in the economy, none more important than the real estate cycle. Real estate is sold as a much safer investment than the constantly fluctuating stock market. Share price volatility is compared unfavourably with the steadier and impressive gains made from real estate which is, we are told, ‘as safe as houses’. ‘I met Phil Anderson in the late 1990s when I sat his short course. On the last day after finishing Phil spoke to the class to let them know about another course that he only held once a year. This was his specialty and it was to do with technical analysis, long term cycles and how to forecast future market movements. This intrigued me because all the so-called ‘experts’ say that market movements are random and that it’s not possible to forecast them. As millions of Americans – and countless others in the Western world – have recently found to their cost, house prices can also suddenly and dramatically drop. Yet no other text on real estate, either current or from the past, mentions this fact, reinforcing the perception that real estate is an almost risk-free investment. 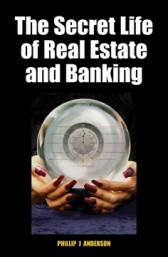 Now for the first time, and long overdue, a book that details and explains the cyclical nature of real estate. The latest real estate downturn in the USA (and in other countries) is just one of many that have occurred since 1800 with astonishing regularity. This book is the story of the American experience of those downturns: the move out of recession, how the banking system facilitates that move, the boom and the characters that shaped it, the bust and then the recession, or worse, depression. This is always followed by a new cycle repeating each phase again, varied only by the new ways bankers find to avoid the regulations put in place after each collapse to ensure it will never happen again. The Secret Life of Real Estate explains, quite simply, how the real estate cycle originates, offers a fascinating study of US history to illustrate the stages through which each cycle passes, then explains why this cycle of boom and bust must repeat, given present economic conditions. Real estate can only be a truly winning investment if you know the cycle. For investors, the author has designed a 24-hour Real Estate Clock which plots the progress of the cycle, with tell-tale signs so that investors can recognise exactly where they are in the cycle at any point in time and so help them decide whether to invest, sit tight or sell. He has refined this clock over a period of many years and those who have attended his courses have found it an invaluable and remarkably accurate guide for their investment strategies, not only in real estate. With its invaluable insights and practical guidance, The Secret Life of Real Estate is a book for both novice and experienced investors alike who want to know why the real estate cycle moves as it does, learn how this movement can be forecast well in advance, and more importantly, wish to learn how to profit from this knowledge. A must read for any serious investor.